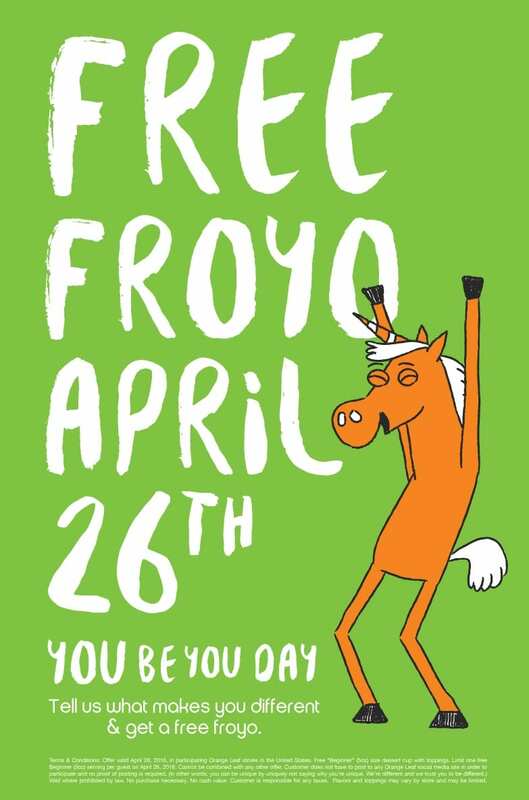 Free FroYo at Orange Leaf for You Be You Day! On Tuesday, April 26th, score FREE FroYo at participating Orange Leaf locations for You Be You Day. Tell the people at Orange leaf what makes you different and get a free 5oz Frozen yogurt with toppings. No purchase is necessary but limit one per person. If you’d rather not tell the Orange Leaf people what makes you different you can be different by not telling them what makes you unique too, so win win. For more information about You Be You Day at participating Orange Leaf locations, please head here. Will you be scoring free FroYo at Orange Leaf on Tuesday?